If you’re a developer (or anyone else) you may quickly get fed up with the Crash Reporter Dialogue box that pops up when an app melts down and crashes in Mac OS X. If you’re pestered by the crash reporter dialog window, then you can quickly turn the window on and off with a defaults command string. Do note that turning off the Crash Reporter dialog window has no effect on crash reports, which are still visible in system logs and the Console app. It simply stops the window appearing in the Mac OS X GUI. 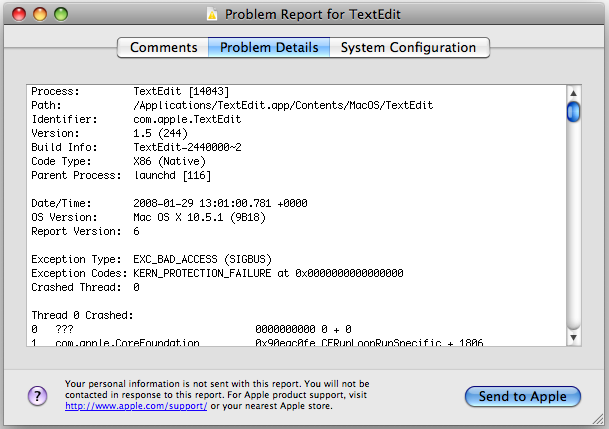 It’s generally best to leave this kind of thing set to the default settings, and sending in crash reports actually helps Apple debug and improve software, but if you have a compelling reason to disable it, now you know how to. For some users, this is helpful, and for some it’s not. This works in all versions of OS X. With High Sierra OS X 10.13.1 running htop. (not top) I saw the crash report agent use 24% of one of my 8 cores… Gee that’s a CPU HOG! So yeah, turned it off.. Apple is not paying for the use of my CPUs.